Hi again. Some time ago I purchased a new Grizzly G0691 tablesaw which came with some problems. Grizzly has finally sent me out the replacement part, which I’ve been trying to install, but I’ve got stuck again, Grizzly is closed until Monday, and I’m wondering if anyone has a suggestion. So I’ve removed the table top, some gears and the old housing, and now I’m trying to transfer the riving knife components from the old assembly to the new one. You can also see on the other side of the assembly that the threaded end of the arbor sticks out far more on the new assembly (right) than the old. 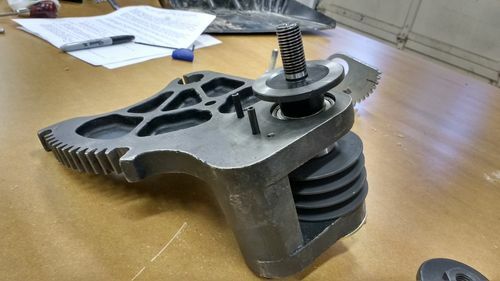 I would have thought that that gap between the housing and arbor face would be a pretty critical spec to adhere to – it basically positions the blade vis-a-vis the saw, affects the alignment of the blade and riving knife, etc?? Anyways, I’m not sure how to proceed. 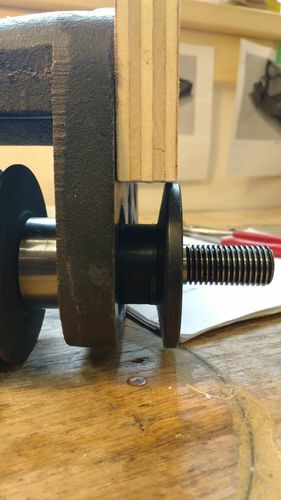 I’m hesitant to try to adjust the position of the arbor vis-a-vis the housing cause if I do any damage to the bearings short or long term then I’m stuck. I think it’s pretty clear that Grizzly is giving you the run around. You might have a good case to sue Grizzly for damages. To me it’s unheard of to expect the customer to have to repair a brand new item, whether it be an automobile, a toaster or a saw. If it were used or out of warranty, that’s a different story. You have too much patience. It’s time you took action and let them know that they are in business to service their customers, not just take your money and walk away. If it were me, I would contact a lawyer. Your time is worth something and from this forum, it appears you have spent enough of your valuable time trying to fix a problem not of your making. I will definitely NOT be shopping at Grizzly. Seems like someone was asleep when that part went through QC. Appears that it was either machined or assembled wrong. I can think of a few options… the first being to have Grizzly send you yet another one and hope for the best. 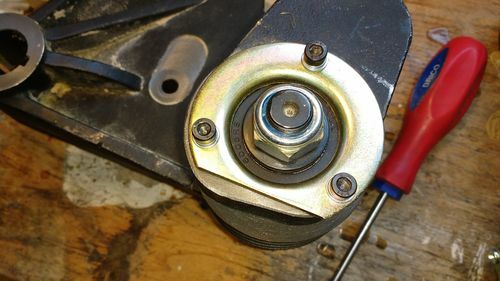 Alternatively, try loosening the large outboard nut on the arbor shaft, and then tightening the bolts that are holding the retaining ring so it’s flush with the housing like on your original. That may push the arbor out far enough to where it is supposed to be. 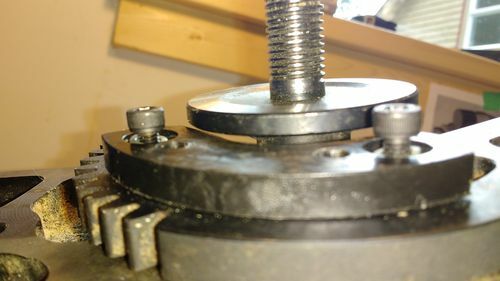 Or, if that doesn’t work, just swap the bearings between the old and new arbor bracket. I’m guessing that they think it was the bearings causing the problem, since that is about the only thing in there that would cause it. 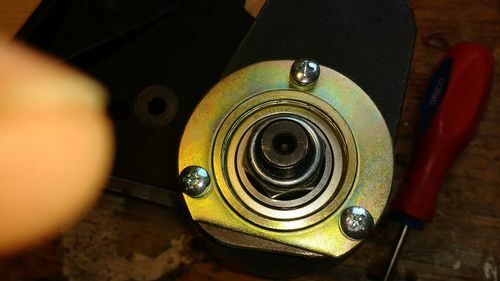 The shielded bearings in the new part have less rotational friction than the sealed ones you originally had. Incidentally, the parts diagram does show shielded bearings, not sealed. 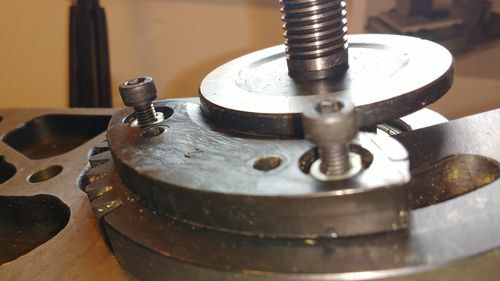 Alternatively, try loosening the large outboard nut on the arbor shaft, and then tightening the bolts that are holding the retaining ring so it s flush with the housing like on your original. That may push the arbor out far enough to where it is supposed to be. 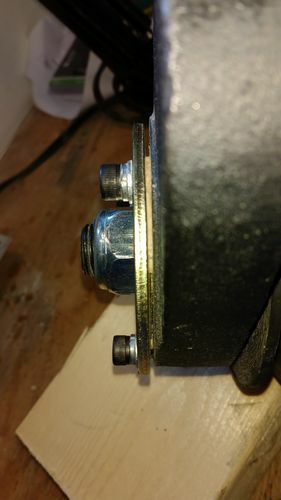 Or, if that doesn t work, just swap the bearings between the old and new arbor bracket. 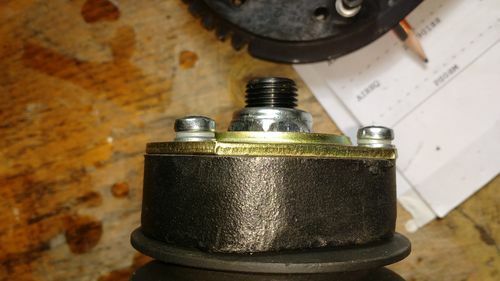 I m guessing that they think it was the bearings causing the problem, since that is about the only thing in there that would cause it. The shielded bearings in the new part have less rotational friction than the sealed ones you originally had. Incidentally, the parts diagram does show shielded bearings, not sealed. Strangely, its actually the new assembly where the retaining ring is flush with the housing and the old assembly where it has a gap, but the old assembly actually fits with the riving knife component and the new one doesn’t. On the bearings, you’re right the G0690 parts diagram references the model number of the bearings included on the new assembly, not old. And the new assembly’s arbor does spin by hand more freely than the old. Do you think they just put the wrong bearings on the old machine? Whats the difference between “sealed” and “shielded” bearings? I’m drawing the line at swapping bearings around …... might as well buy a used saw if I’m going to be doing that. There is very little difference between sealed and shielded, and it should not be enough to notice in that application. The seals will produce a slight drag where they contact the race, while the shielded ones don’t – but the main difference is in the maximum rotational speed – shielded bearings have a slightly higher max. speed. But since we are talking about speeds several times faster than what a TS arbor spins at, the difference is a non-issue. 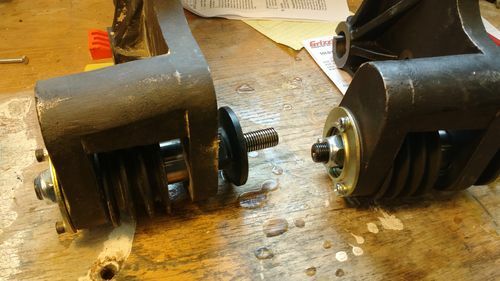 Just an FYI – myself and many others prefer to swap shielded bearings out with sealed ones when restoring old machinery. The seals will keep crap out of the bearing a lot better than shielded ones. You’ve got the patience of a saint Arthur. You should have drawn the line a long time ago…. You’ve allowed Grizzly customer service to take advantage of (screw) you, and now, they’ve dropped the ball yet again. Do what you should have done long ago….raise SUPREME hell until they offer you a proper solution. Which should have been a full replacement with all shipping charges paid by them to begin with. They sold you an expensive product with a major defect. It should have been replaced on their dime, end of story. I wonder if it was damaged in shipping. I feel sorry for you and what you have gone thru. You are more patient and nice than I would be. I would put it back together with the old parts and send back to Grizzly. While I think Grizzly is a good value, I would not buy one based upon the chance of having such a problem. The probability is low but I would not want to have one. I would rather be making sawdust. I would tell Grizz to come pick up the saw. The issue if you look at the original assembly is the bearing, it is not pressed in correctly causing drag. 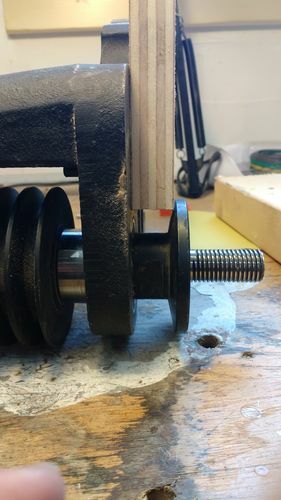 Bet if you take the cover off that bearing, it has a crushed surface.